Don’t wear six pants at a time, don’t put pants on your head and certainly don’t wear your sister’s pink frilly ones…! Such a lot to remember, and which way does everything go around? Trousers first, then pants? This small boy is having such a lot of bother getting dressed that he’s off to Sergeant Smart for help, but when he arrives at the castle, the sergeant and all his soldiers are still asleep and the Queen is about to arrive to inspect them! Pyjamas, pants, inside out shirts, undone buttons and chaos follow! ‘They have pants round their ankles and pants up their legs. They have pants on their elbows And pants on their heads…. There are even pants on the cat! Can the Queen sort it out? 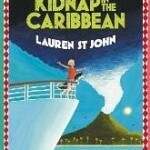 Last year’s winner of the Blue Peter Award returns with the next Laura Marlin Mystery, Kidnap in the Caribbean. In this story, Laura Marlin is off to the Caribbean with her uncle, who is an undercover detective. They have won a fantastic trip to paradise but as soon as they board the luxury cruise ship bound for Antigua, strange and sinister things start to happen…. Soon Laura and her friend Tariq are involved in another dangerous adventure. Look out for pirates, a volcano and hungry sharks – it’s all in a day’s work for these feisty young sleuths. This series is perfect for Enid Blyton fans, or anyone who loves adventure stories.